Drought Resilience: Controlling for drought variables with the AFDM helped USAID establish that a) the overall shock exposure in Niger vs. Burkina Faso during their RISE study was due to insect invasions and food price increases, not climate; and b) their market-based interventions in the PRIME program in Ethiopia were effective. Health and Epidemiology: a) Temperature drives both tsetse fly relative abundance and trypanosome prevalence in Tanzania; b) Risk of cholera transmission in Cameroon varies with average daily maximum temperature and with the precipitation levels over the preceding two weeks. Impact of Irrigation Dams: Use of AFDM drought indices helped show that in northern Nigeria households downstream of the dams were less affected by drought and enjoyed more stable growth rates and food consumption than those upstream or in similar but undammed basins. Human migration: Rainfall shortages and excess temperature, with soil moisture as an additional important factor, are strong drivers of out-migration from South Africa, especially for black and low-income migrants. To build capacity for drought monitoring in Southern African Countries, the Princeton University’s AFDM team held a workshop in Harare, Zimbabwe in November 2016. Co-organized by WaterNet and the Southern African Development Community (SADC), the workshop demonstrated the applications of the AFDM for about 30 water professionals from SADC countries and the WaterNet Secretariat. The AFDM was also featured as part of the training course on “Applying Satellite Remote Sensing For Water Resources Management in Africa” held in January 2019 in Pietermaritzburg, South Africa. For additional information, visit the G-WADI or Princeton websites or contact Justin Sheffield. Sheffield, J., Wood, E.F., Chaney, N., Guan, K., Sadri, S., Yuan, X., Olang, L., Amani, A., Ali, A., Demuth, S., and Ogallo, L. 2014. 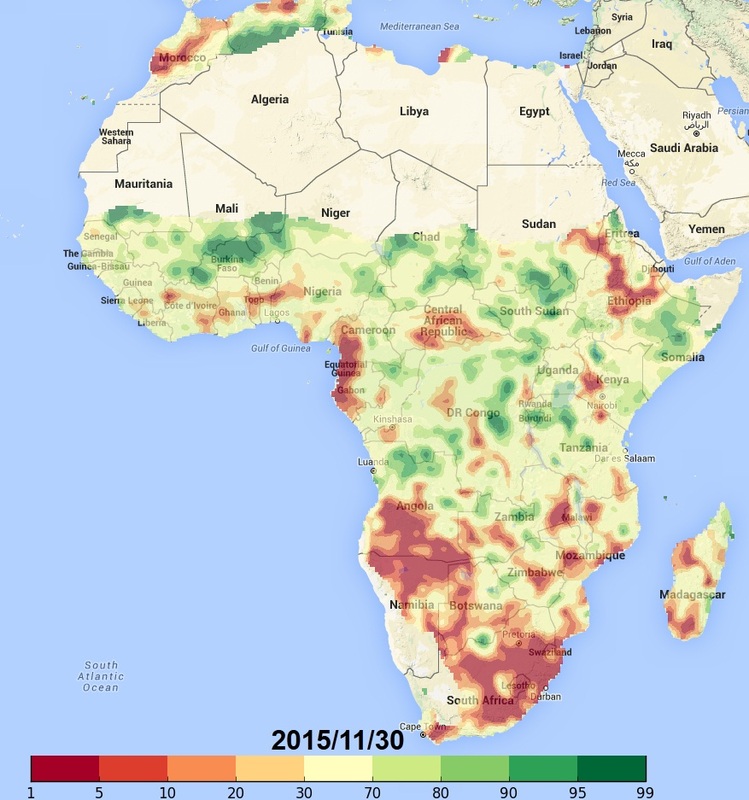 A drought monitoring and forecasting system for sub-Sahara African water resources and food security. Bull. Am. Meteorol. Soc. 95 (6), 861–882. Nnko HJ, Ngonyoka A, Salekwa L, Estes AB, Hudson PJ, Gwakisa PS, Cattadori IM. 2017. Seasonal variation of tsetse fly species abundance and prevalence of trypanosomes in the Maasai Steppe, Tanzania. J Vector Ecol. Jun;42(1):24-33. doi: 10.1111/jvec.12236. Mastrorillo, Marina, Rachel Licker, Pratikshya Bohra-Mishra, Giorgio Fagiolo, Lyndon D. Estes, and Michael Oppenheimer. 2016. The influence of climate variability on internal migration flows in South Africa. Global Environmental Change 39: 155-169. Sagara, B. and Hudner, D. 2017. Enhancing Resilience to Severe Drought: What works? Evidence from Mercy Corps’ PRIME Program in the Somali Region of Ethiopia. Portland, OR:Mercy Corps. Takeshima, Hiroyuki, Adetola I. Adeoti, and Oluwafemi Adebola Popoola. 2016. The impact on farm household welfare of large irrigation dams and their distribution across hydrological basins: Insights from northern Nigeria. Vol. 35. Intl Food Policy Res Inst. USAID. 2016. Feed the Future: Resilience in the Sahel-Enhanced (RISE) Project Impact Evaluation. Volume 1. Baseline Survey Resilience Analysis. Washington, DC: USAID.